van den Top (2004). Medium [16" tall x 24" wide]. Lavender/blue flowers mid season. 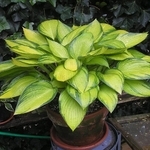 Hosta 'June Fever' PP#15340 is a colorful golden sport of 'June' with distinct green margins. 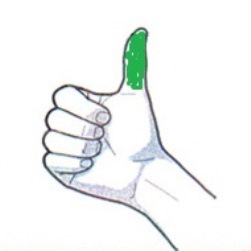 The leaves are of good substance and are slightly cupped upon maturity. The shiny foliage tolerates more sun than most hostas and actually displays brighter color with exposure to some direct sunlight. We have found this beauty to be a strong, fast grower. A special import from Belgium. Fertile.